For each of these, I provide different level descriptors for 1 mark up to the maximum available for that particular essay feature. Then, it’s simply a question of shading off the correct cell in the grid and providing an explanation on the right-hand side. The benefits of this approach are that I mark the essay much more methodically, but also much more quickly. Rather than make one overall evaluation right at the end of the essay, I instead make separate, shorter but more focused comments about half a dozen features of the piece. This provides the students with feedback which is directly comparable to their previous essay rubric so they can spot exactly where they have improved, and where they need to focus next. 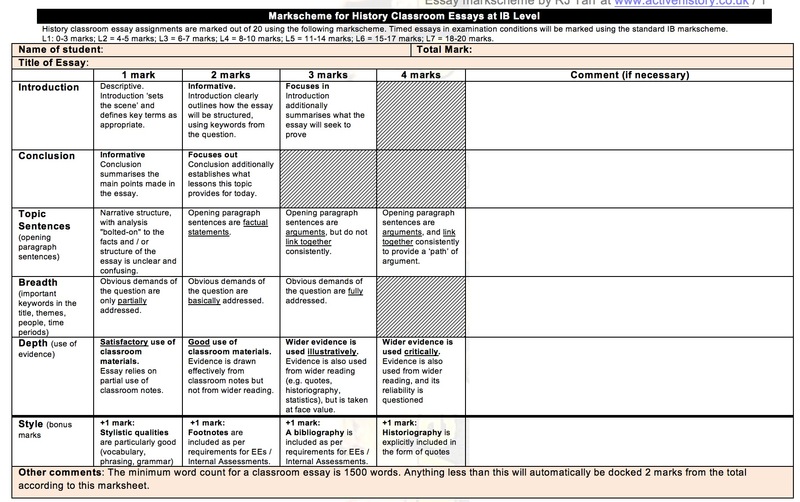 If you have similar rubrics for other subject areas that you’d like to share on this blog, feel free to contact me!